Lock in a great price for Best Western Plus Tigullio Royal – rated 9.3 by recent guests! Loved the location! Staff was amazing and gave us great recommendations! Very clean! Looking forward to our next stay! Amazing sea view rooms. Delicious and generous breakfast for only 6 euros. Very friendly and helpful staff. The hotel has a great location near the beach and the historic center. Would definitely recommend it. The hotel was In a great position with the car park literally over the road. All the hotel staff were amazing. Friendly, helpful, professional. The customer service really was great. We had a deluxe room which was a great size. Excellent air conditioning thank goodness with temperatures over 30 degrees. The room was immaculate and we were impressed with the fact the room was serviced twice daily. Comprehensive breakfast eaten on veranda every morning. Again, staff excellent. We enjoyed evening drinks on the Sky Bar overlooking Rapallo. Great memories! Clean rooms. Fabulous location. Safe. Great showers. Definitely recommend. We had an amazing sea view from our balcony. The staff went out of their way to make us feel comfortable. By far, this was our favorite hotel of our stay. The front desk even offered to go to the post office to get us stamps to mail postcards. The hotel was right by the water and a lovely private beach. They were also right by the ferry to go to Portofino and very close to a train to go to Cinque Terre. We could have stayed there another month easily. Everything! The staff was exceptional, the rooms and hotel modern and immaculate. I would stay again in a heartbeat. The view from the rooftop bar is spectacular. Our balcony/sea view was lovely. Exploring the ally ways for shopping and cafes was so much fun. The beach is yards from the hotel, as is the ferry for a quick trip to Portofino! The hotel staff is wonderful and so helpful. I left my phone at the hotel, and they quickly arranged to forward it to our hotel in Rome. The housekeeping person was courteous, friendly and very accommodating. Location is ideal and close to very good restaurants. Best Western Plus Tigullio Royal This rating is a reflection of how the property compares to the industry standard when it comes to price, facilities and services available. It's based on a self-evaluation by the property. Use this rating to help choose your stay! One of our best sellers in Rapallo! Offering panoramic views of the Gulf of Tigullio, the Tigullio Royal is a 7-story building set on Rapallo's seafront promenade. The ferries to Portofino and the Cinque Terre leave from nearby. The rooms are all air-conditioned. Rooms at Best Western Tigullio Royal come with an LCD TV with Mediaset Premium channels, a mini-bar, and a tea/coffee maker. Some have a private balcony, and some have a partial or full sea view. A generous buffet is served each morning, and can be enjoyed on the sea-view terrace in fine weather. Guests can also relax with a drink in the bar, or in the small wellness area. 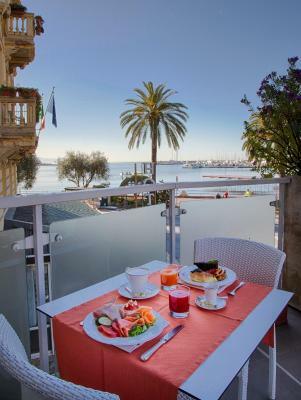 This grand hotel is 5 minutes' walk from Rapallo Train Station and it is close to the city's market area. This is our guests' favorite part of Rapallo, according to independent reviews. This property also has one of the top-rated locations in Rapallo! Guests are happier about it compared to other properties in the area. This property is also rated for the best value in Rapallo! Guests are getting more for their money when compared to other properties in this city. When would you like to stay at Best Western Plus Tigullio Royal? This twin/double room features a mini-bar, electric kettle and air conditioning. This double room has air conditioning, flat-screen TV and mini-bar. This double room features a balcony, satellite TV and air conditioning. This suite features a flat-screen TV, mini-bar and electric kettle. House Rules Best Western Plus Tigullio Royal takes special requests – add in the next step! Best Western Plus Tigullio Royal accepts these cards and reserves the right to temporarily hold an amount prior to arrival. Have suggested the curtains could be better at blocking out the light. The staff were wonderful and the hotel is beautiful. It’s a fabulous location and the town is working hard to repair the damage to the seafront caused by the October storm. In the center of Rapallo, nice sea view, over the carugio (the traditional shopping street), parking just in front. Fantastic location - 100m to the see and harbor view from the balcony, spacious and very clean rooms. Public parking (12Euro/day) in front of the hotel. The staff is very friendly and helpful. Looking forward to come back. Location, new building and staff made this the perfect location. From Mariola in the restaurant (what an absolute asset to the business). She was brilliant and breakfast was simply outstanding. To Moses in housekeeping, we loved every minute. New rooms with views in the heart of the action. The Hotel as very central, the staff were very friendly and knowledgeable, the breakfast was excellent, a shame we got there a few days after a very bad storm which was still being cleared way. The hotel was not damaged though. The staff were very friendly,helpful and all went the extra mile to please you. The hotel is extremely clean with pleasant surroundings and a great location. The breakfast was superb. I would recommend this hotel . Location is excellent. Parking is easy. the local restaurants are good. There was no view from the room. Fantastic customer service and friendliness of staff.